A trip to the cinema; the cornerstone of any date-night, child’s birthday party and the balm for boredom during the long summer holidays. Often combined with restaurants, fast-food, shopping malls and bowling, they are the pumping ventricles of evening and weekend activity in town centres. Being able to see the latest Pixar film in all its 3D glory, J.K Rowling’s newest Fantastic Beasts movie offering with immersive surround sound or Robin Hood on 30ft of explosive screen is a fantastic experience for children and adults alike. Able-bodied or disabled, it’s always a joy to share the age-old art of film on the big screen, however for those disabled cinema-goers with additional requirements, it’s not always possible without the right toileting facilities. It can be an ask for any of us to hold it in during a 2 hour long film; we’ve all had that mad dash to the loo – doing the 2D shuffle across people’s legs in the dark, whispering apologies and hunching like a Disney villain, praying that we don’t miss anything too crucial. But for many disabled viewers, there simply isn’t an option to hold it in, in fact, there hasn’t been another option at all. 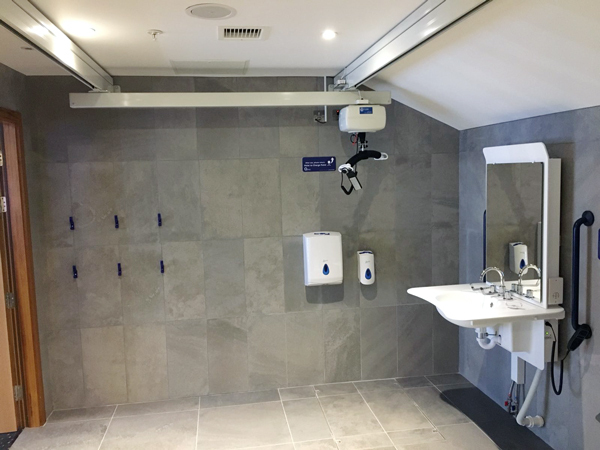 Vue Cinema is leading the charge, ahead of their competitors, to ensure their facilities are entirely accessible through the provision of a brand new Changing Places toilet – the first of its kind in a dedicated Cinema in both the UK and the World. The brand new Bromley VUE cinema has been in development and has officially opened last month on the 28th November 2018. 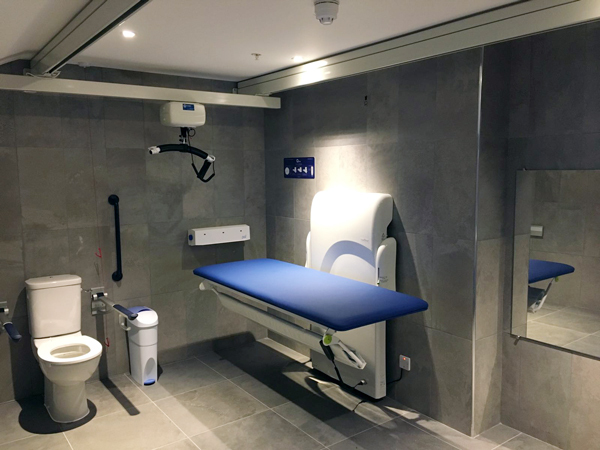 The impressive new toilet at the Vue Cinema in Bromley features the OT200 Ceiling Hoist and XY Track System offering full room coverage, a Height Adjustable Changing Table and Washbasin and all the necessary Changing Places accessories; the stoma bag shelf and privacy screen to name a few. Hopefully, this will represent the first of many, but at the moment it’s a very positive step forward. 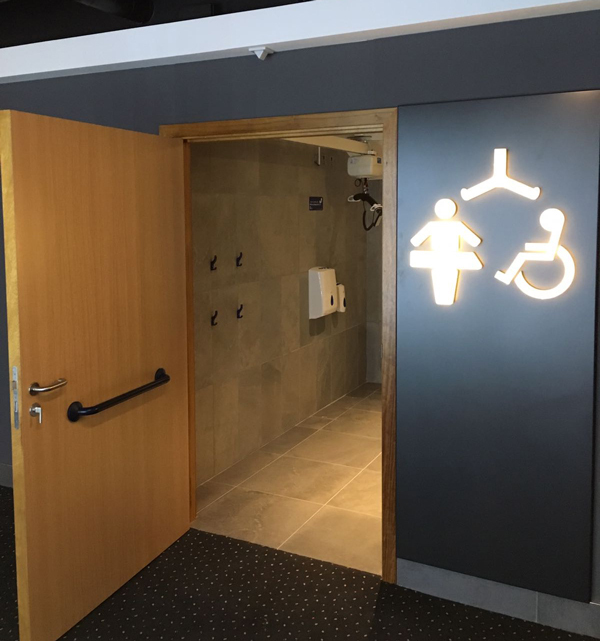 The Changing Places toilet will allow movie buffs, fanatics or just casual film-goers to visit the cinema even if they have additional needs. It eliminates worries for parents or carers of dirty floors as changing surfaces, interrupting the experience and missing a film part-way through to find somewhere to toilet or even avoiding it all together. OpeMed are very proud to have been involved in the design, supply and installation of the toilet at the Bromley Vue Cinema. Very well signposted, it’ll be hard to miss for visitors and the sleek, modern finish delivers a hygienic and welcoming environment. If you would like to arrange your own consultation with our Product Specialists, contact us on 01252 758 858 or email us to book your appointment now. Would you like to discover more about Changing Places? Simply click here for information.